A new world has opened to writers who wish to have their words turned into finished books. With technological advances in typesetting, printing, distribution, and sales, self-publishing has become a reality. But while converting your writing into a commercially available title may sound relatively easy—based upon the claims of some companies that offer this service—there are many important considerations you should be aware of before going to press. 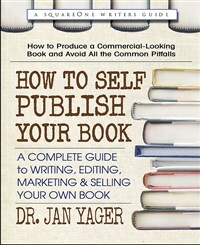 Publishing expert Dr. Jan Yager has created an easy-to-follow guide that will take you from a book’s conception and writing to its production and sales. Whether your work is fiction or nonfiction, How to Self-Publish Your Book offers sound and proven advice at every turn, enabling you to avoid common pitfalls along the way to becoming a self-published author. The book is divided into three parts. Part One takes you through the initial manuscript preparation—setting your goals, writing, sequencing, editing, and proofing, as well as creating a business plan for your book’s eventual release. Part Two focuses on the actual production of your book. It explains the importance of cover and interior design, what you need to know about producing physical books and e-books, and how to turn your title into an audiobook. Part Three provides key information on how to market and sell your book—subjects that are crucial to a title’s success, but of which most writers have very little understanding. Also included is a valuable resource section that guides you to websites which offer essential information on self-publishing service providers, including complete self-publishing companies as well as freelance editors, proofreaders, printers, distributors, marketers, and publicists. Today, self-publishing workshops and lecturers charge hopeful writers hundreds of dollars, promising to turn their self-published books into bestsellers. The fact is that your book’s chance of success starts at its origin, not with the finished product. However you choose to produce your book, whether through a self-publishing company or through separate services, here is a complete road map to what lies ahead—based not on hype or wishful thinking, but on Dr. Jan Yager’s lifetime of experience in the world of publishing. Dr. Jan Yager received her M.A. in criminal justice from Goddard College, and a Ph.D. in sociology from the City University of New York Graduate Center. Beginning at the age 23, she began her publishing career first working at Macmillan Publishing Company, and then at Grove Press working directly under the company’s founder, Barney Rosset. There she learned to do everything from selling foreign and subsidiary rights to acquisitions, publicity, and sales. Jan’s life has been all about writing and publishing books. She is the author of more than 40 books published by such major houses as Simon & Schuster, Penguin Random House, Scribner, Wiley, and Doubleday, as well as self-published by her own company, Hannacroix Creek Books, Inc.
Dr. Yager has been interviewed on such major TV shows as Oprah, The View, the Today Show, Good Morning America, The Early Show, CBS Sunday Morning, CNN, MSNBC, and BBC television in London. Dr. Yager’s award-winning titles include Foreign Rights and Wrongs; Effective Business and Nonfiction Writing; Career Opportunities in the Publishing Industry (with Fred Yager); Business Protocol; Victims; When Friendship Hurts (translated into 29 languages); Friendshifts; The Pretty One (a novel); Untimely Death (a novel, with Fred Yager); The Quiet Dog (illustrated by Mitzi Lyman); Work Less, Do More; Put More Time on Your Side; and others. Dr. Yager and her husband, Fred, reside in Stamford, Connecticut.